Donald Hatfield was born in 1947, and lives in Napa, California. He first became involved in art while a graduate student in divinity at Fuller Theological Seminary in Pasadena, California, in the late 1960s and early '70s. Charles Cross, the portrait painter, had a studio nearby, and Hatfield would often go to him for critiques of his work. Eventually, over many games of chess and bottles of wine, a strong friendship developed between the two men. "He was like a surrogate father," Hatfield says of Cross. Hatfield spent considerable time in the studio, watching Cross work, asking questions about art, but when Cross invited him into an art class, he resisted. "I didn't even know the primary colors,". Hatfield's sole previous encounter with art happened in the eighth grade: a teacher held up a picture of a dog he'd drawn and announced to the class "This is NOT what I wanted." Finally Don studied with Cross for two years. "Charlie would always critique my work," Hatfield says. "Then I brought my first color work in-a pastel portrait-and he just started crying". Hatfield was moved by Cross's reaction, but he was still not able to convince himself of his calling, and he left his mentor. "Art just disappeared from my life", he recalls, "but I continually went to museums and looked at art books. Occasionally, I would do a pastel portrait, but it never occurred to me that painting would one day take center stage." Driven by the urgency to provide for his family, which by this time consisted of four children, he proceeded to spend the next seven~eight years doing anything he could just to get by. During these years, Hatfield worked as an evangelical minister, a carpenter, and in retail management. While attending a business conference in Chicago, he went to visit The Art Institute of Chicago and saw a painting by Giambattista Tiepolo (1696-1770) that so impressed him, it changed his life. "Charlie told me that I had to look at the legacy of oil painting to develop my own taste. John Singer Sargent loved Tiepolo," Hatfield, who admires Sargent, says. "He saw Tiepolo could edit the form and simplify it. So I'm in there looking at Tiepolo for the same reason Sargent does!". It was a time of intense personal crisis for Hatfield, the kind of time when one's senses are particularly open to the messages of the universe. Hatfield decided he was going to become a full time artist. Within two weeks (& in 1979), Hatfield, his wife, and four children, who were then living in the Midwest, packed up their belongings and moved to Santa Fe on the advice of the premier portrait painter Ray Kinstler. During their first year there, Hatfield realized he needed more training, so he and his family returned to his native California, where he took workshops with Dan McCaw and studied with Sergei Bongart for several years and where he decided to settle. "Sergei was a wonderful presence, a great teacher." Don diligently worked and perfected his style that we recognize today. His unique impressionistic style has brought him great acclaim in the art world and around the world. 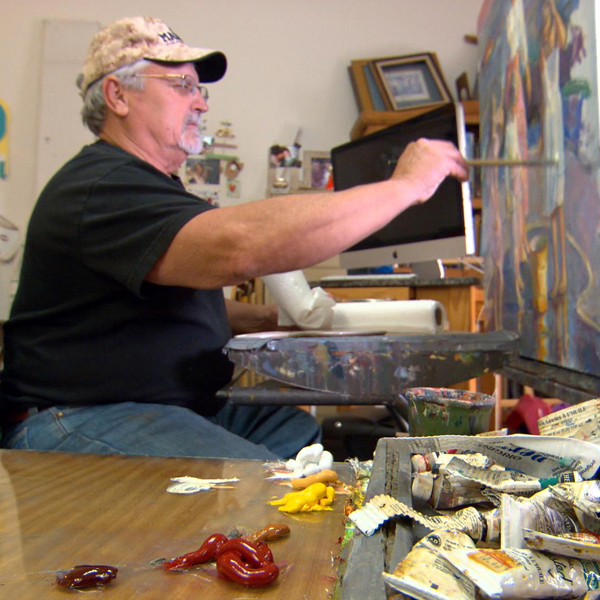 Don's paintings hang in many important private and corporate collections throughout the world.